The City of David is an archaeological site that reveals the birth place of Jerusalem. About 3,000 years ago, King David left his beloved city, Hebron, and headed for Jerusalem with one clear goal, to turn Jerusalem into a political, religious, and spiritual capital for the entire Jewish people. The City of David gives its visitors a rare opportunity to experience ancient Jerusalem and watch ancient stories come to life before their eyes. The City of David is located southeast of the Old City, on the Ophel Hill near the Western Wall which is now under the Arab village of Silwan . The location of the ancient city in Biblical studies makes the City of David the most important archaeological site in Israel. The most excavated site in Israel, excavations continue to take place with new and fascinating artifacts uncovered regularly. The City of David National Park offers a variety of attractions, tours, and surprises that you won’t find anywhere else in the world: an extraordinary archaeological experience at the sifting project in Emek Tzurim National Park, guided Segway tours at the Peace Forest attractions complex, fascinating tours of the "Petra of Jerusalem" located at the foot of the monumental tombs of the Kidron Valley, known as the "King's Valley", and a unique tour of the city of kings and prophets where stories in biblical Jerusalem took place and half of the books of the Bible were written. Experience a unique tour in an underground tunnel following the enchanted past of Jerusalem, the most intriguing city on earth. Which stories actually happened? What remains today of those ancient stories? The answers will be revealed in a picturesque and enriching way that will lead you through the depths of the earth and history, illuminating fascinating secrets from the past. Take a magical journey between the tunnels, walls, and fortifications of ancient Jerusalem! Get to know the underground passages through which the city was conquered, go down to the spring where kings were crowned, and light the way with flashlights as you walk through the waters of Hezekiah's massive tunnel. Come discover where it all began! 10:00 a.m., 12:00 p.m., 4:00 p.m. When did you last travel 2,000 years back in time? The City of David invites you to join us on the Jerusalem Time Tunnel Tour for an exclusive glimpse into Herod's Jerusalem and the Second Temple Period. In the depths of the city, concealed beneath the main street of its ancient ruins, is an underground tunnel that served as a hiding place for the last of the rebels on the eve of the Temple’s destruction. Learn about the daily life of ancient Jerusalem’s residents through discovered artifacts, cooking utensils, gold bells, and Roman swords. The tour comes to a close at the underground foundations of the Western Wall, an incredible vantage point you have yet to encounter! Join us for an enjoyable and unforgettable experience! Hallelujah is an unforgettable multi-sensory experience made up of two groundbreaking light and sound shows: one on the surface of the Old City walls (in the Givati parking lot) and the second projected on the ancient ruins of the City of David (Area G). The sound and light shows utilize groundbreaking technology, the only ones of its kind in Israel. Unlike most of the other existing shows, the Hallelujah presentation takes place in the open air, under the night sky, taking advantage of Jerusalem’s wonderful weather. The show features the stunning backdrop of the Old City, Mount of Olives, crests of Mount Scopus, King's Valley, and the slopes of the City of David for an extraordinary experience. The show is about an hour and a half long and allows you to combine the extraordinary multi-sensory night presentation experience together with a magical night out in Jerusalem. Hallelujah tells the story of the return to Zion and the rebuilding of Jerusalem after its destruction about 2,000 years ago. 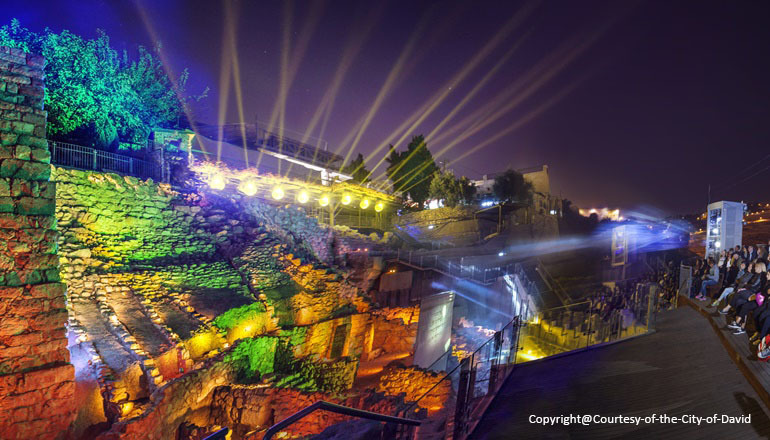 Utilizing innovative video mapping technology, it stands out as one of the most extraordinary attractions in Jerusalem and Israel. Hebrew Show Summer Times (from sunday to thursday): 8:15 p.m., 9:00 p.m., and 9:45 p.m .
Hebrew Show WinterTimes (sunday and tuesday to thursday): 6:15 p.m., 7:00, and 7:45 p.m .
* If it's raining you need to call the reservation center *6300 to know if the show is running. *Advance registration is required for groups ** 3D movie tickets are available only in addition to the museum entrance ticket.